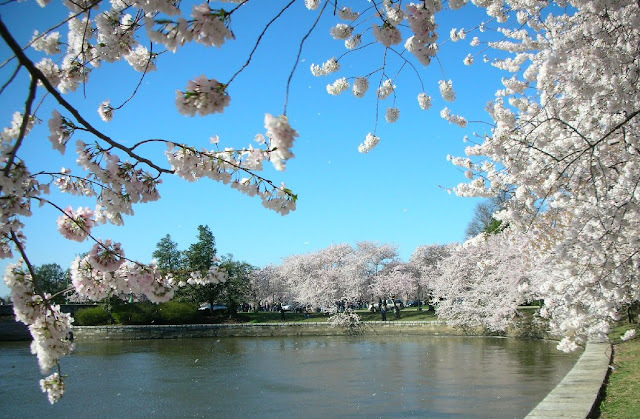 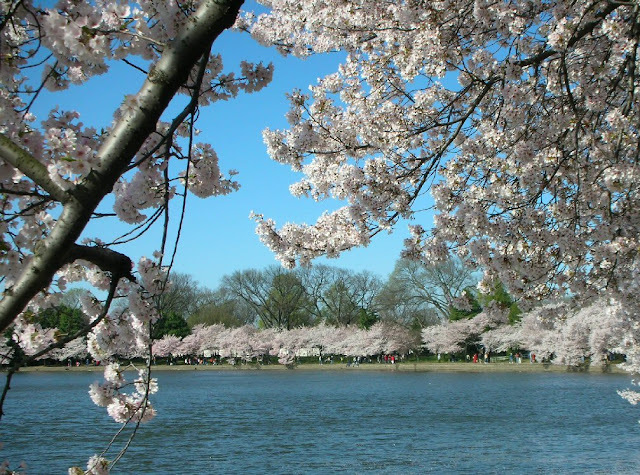 Washington in the Springtime is one of the prettiest and most colorful cities in the world. 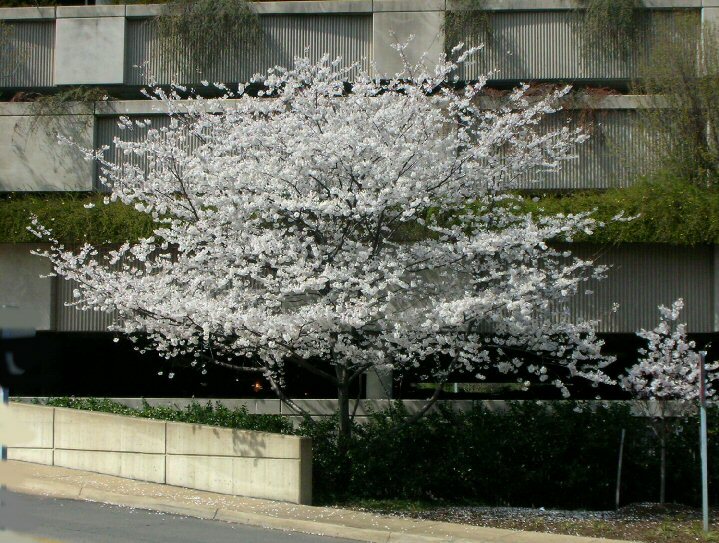 Embassy Row. Many houses have large flower gardens in front. 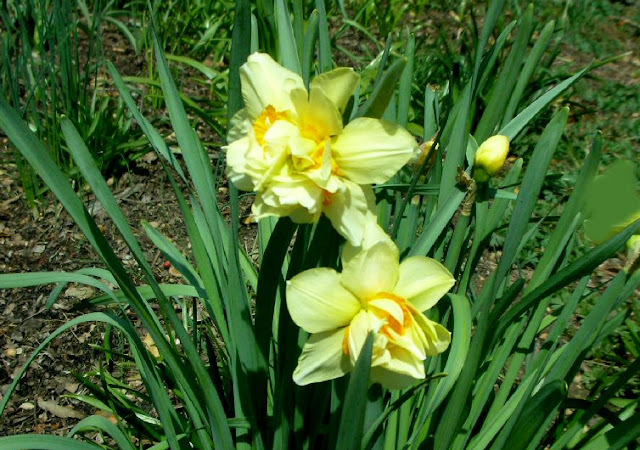 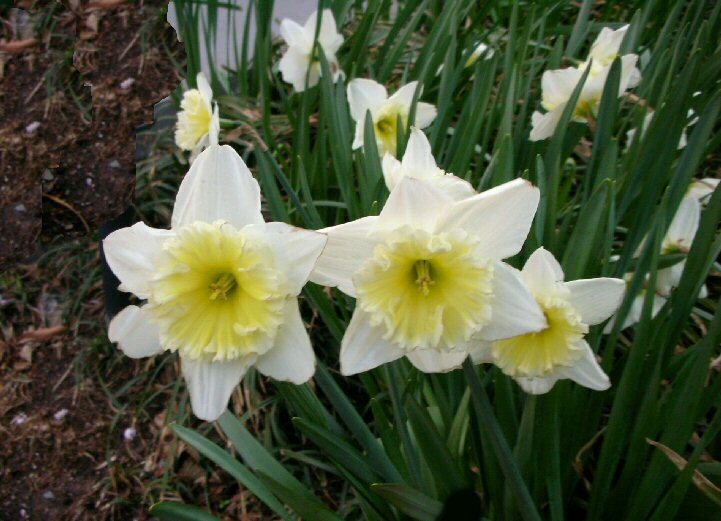 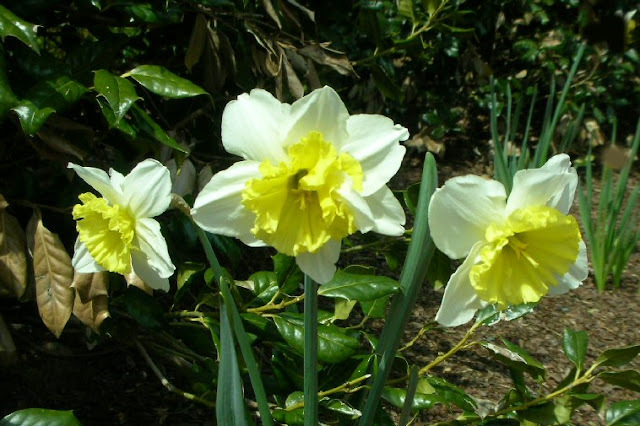 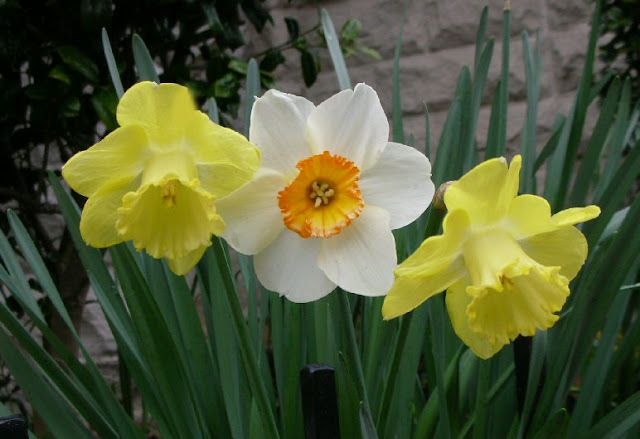 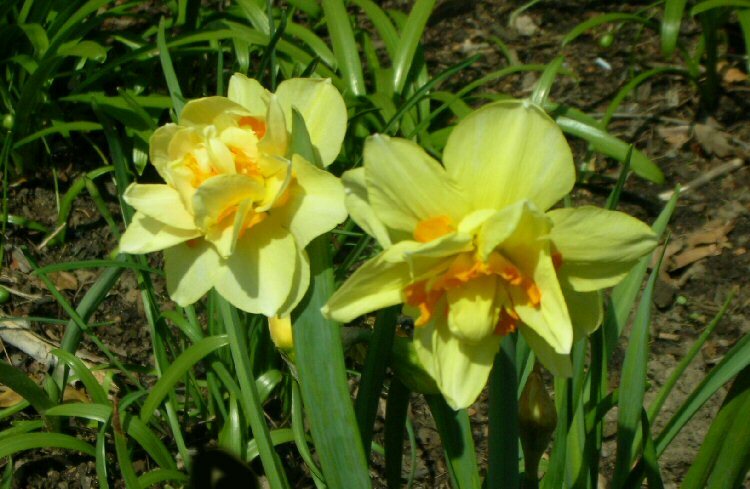 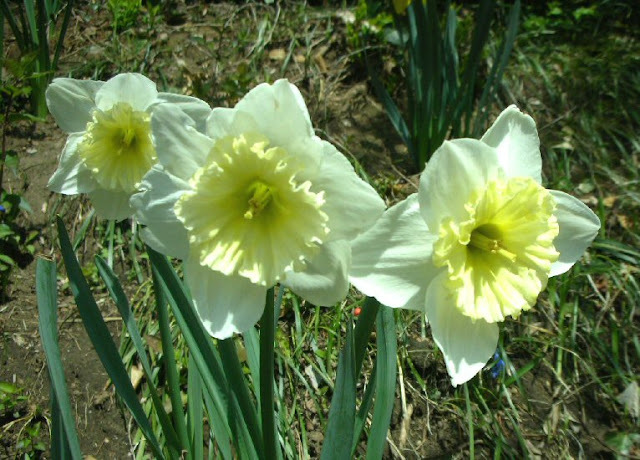 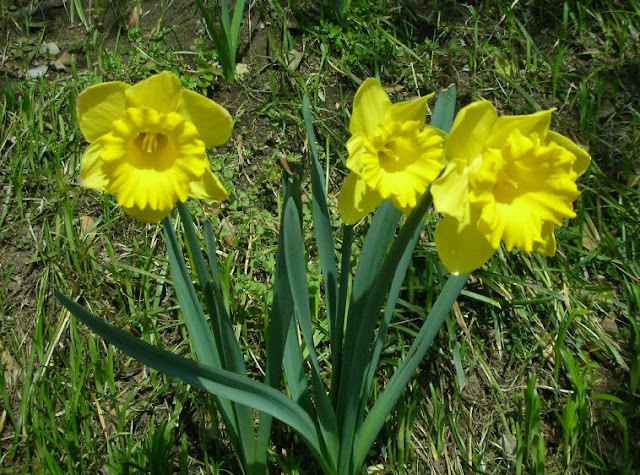 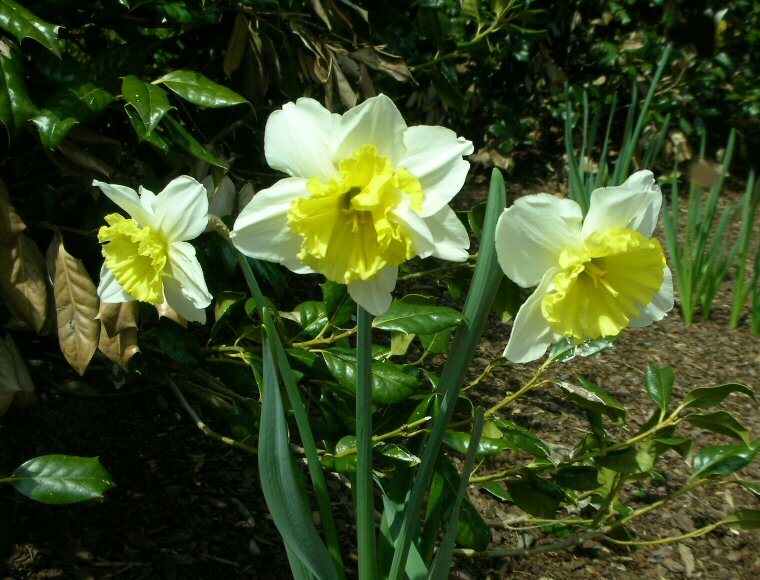 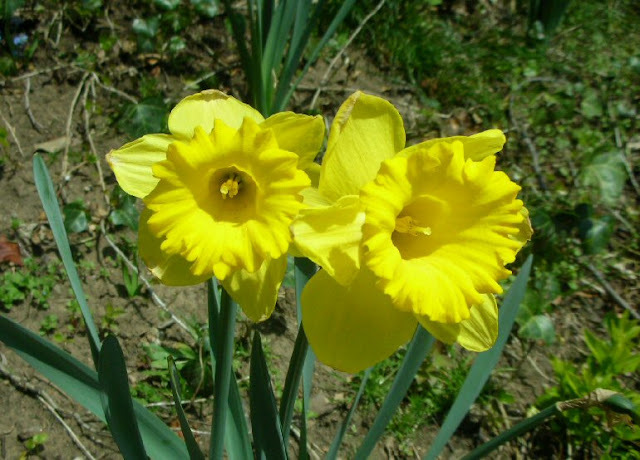 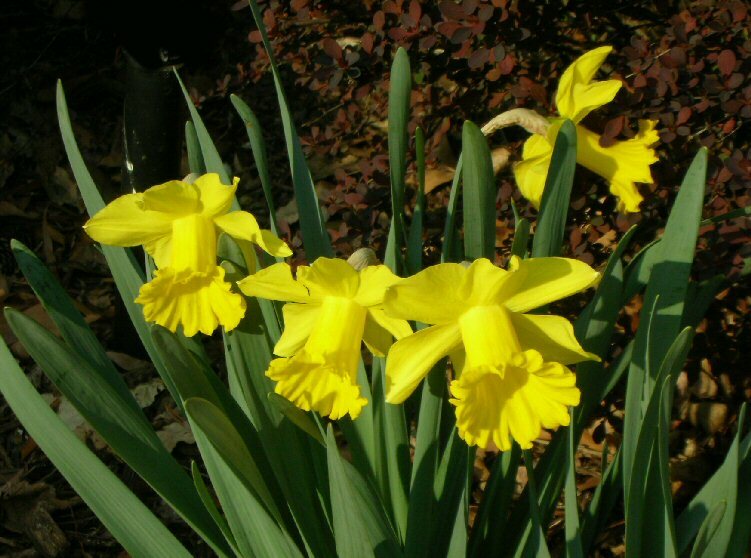 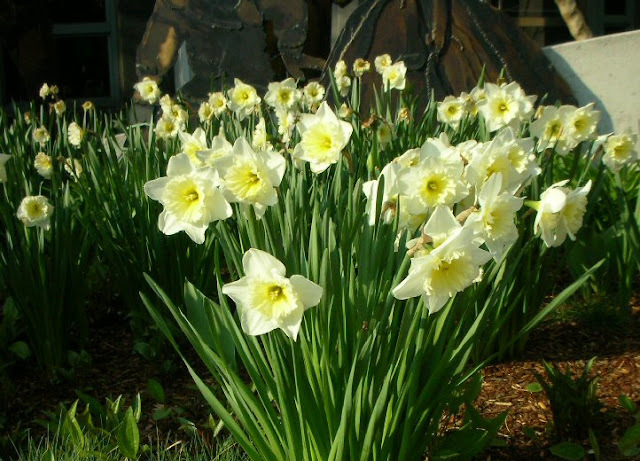 Pair of beautiful pale lemon yellow daffodils. 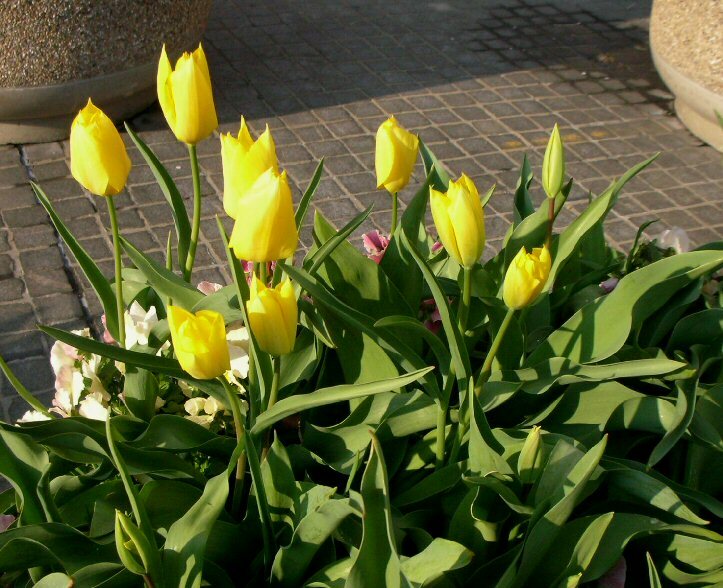 to share some of the wine. 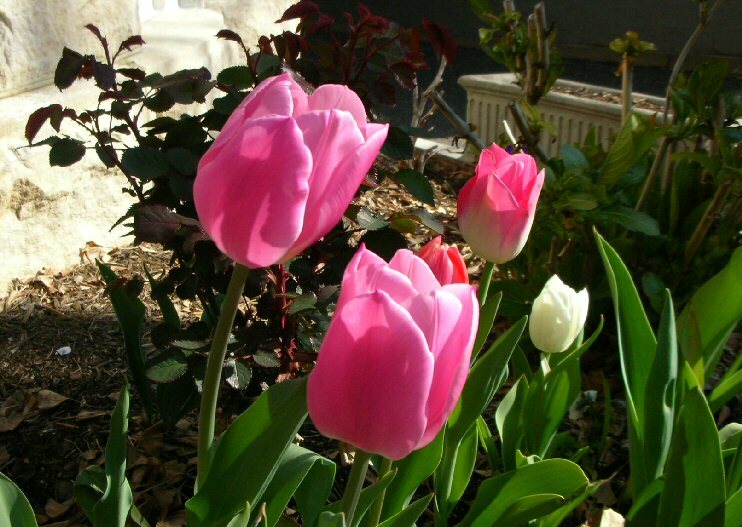 Lovely spring mornings. 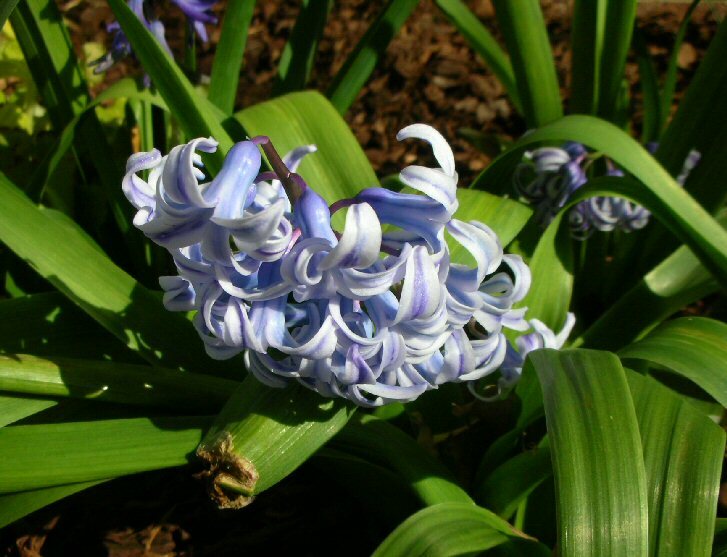 up to Soestdijk Palace, which is the country residence of the Dutch royal family. 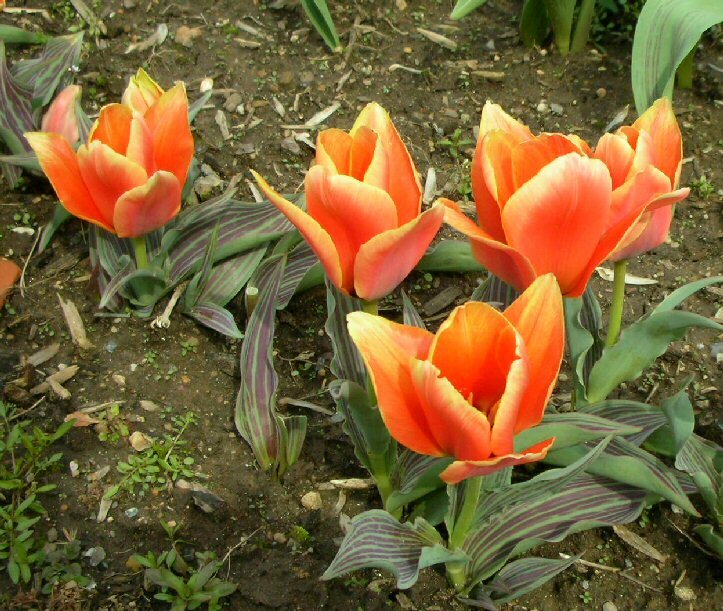 We were gently asked to leave, so we rode out. 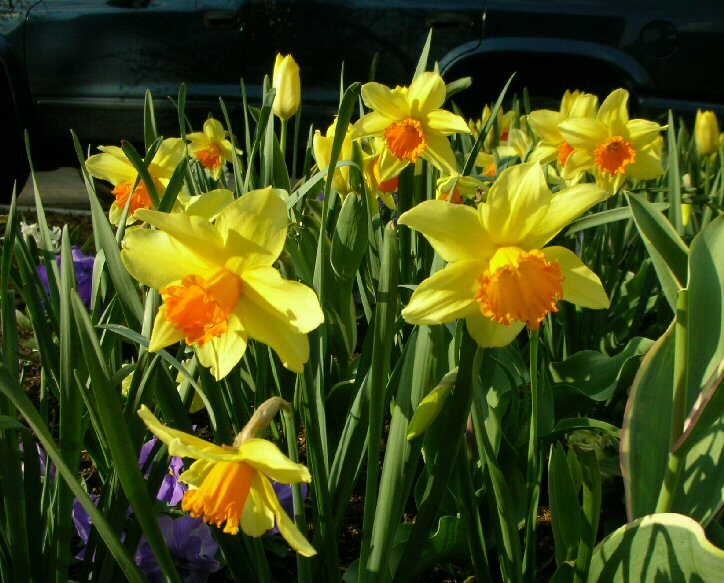 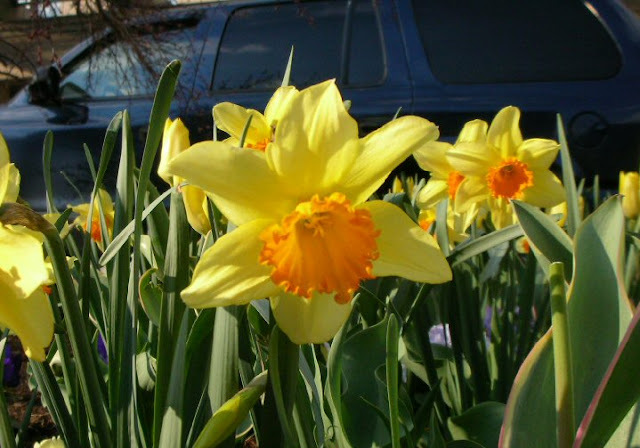 Yellow daffodils with frilled orange trumpets. 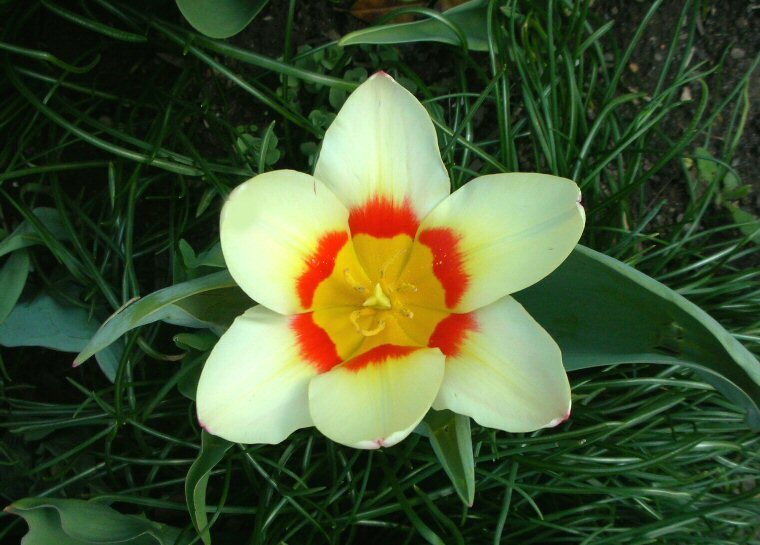 There are many more petals in the center. 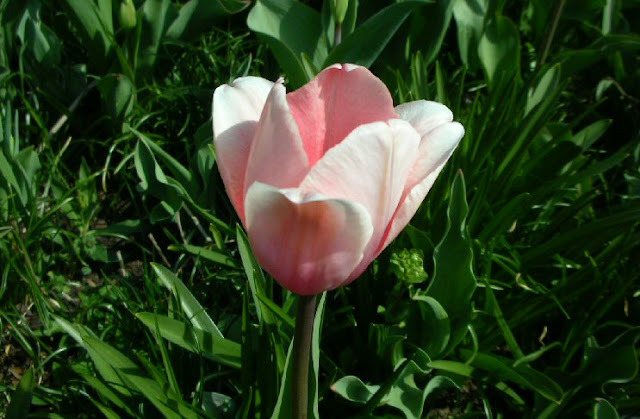 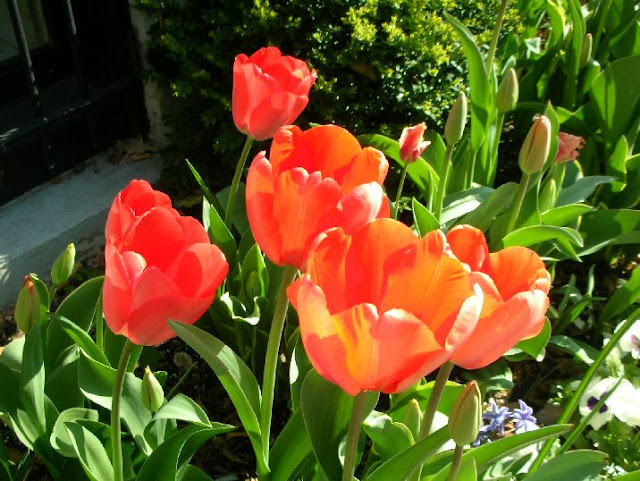 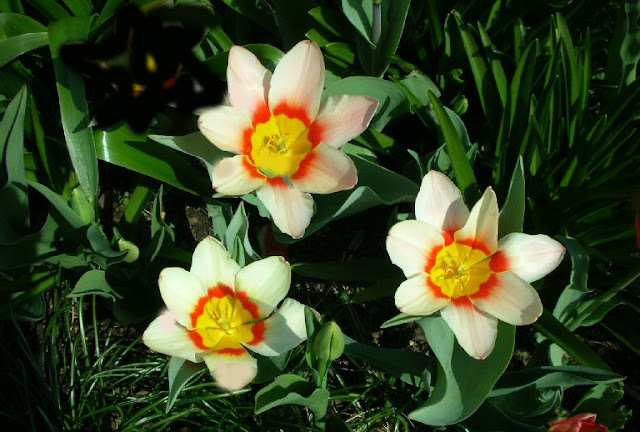 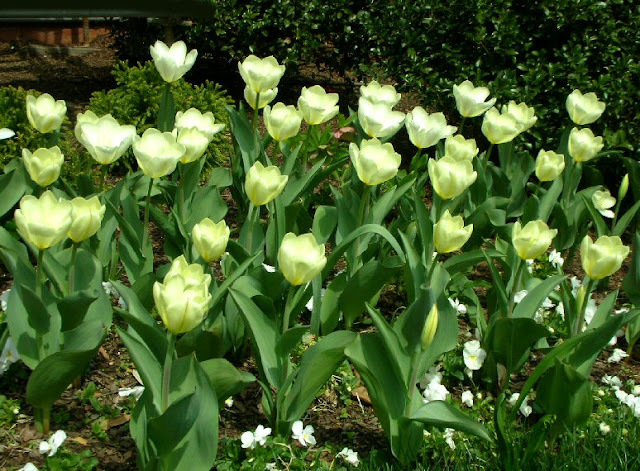 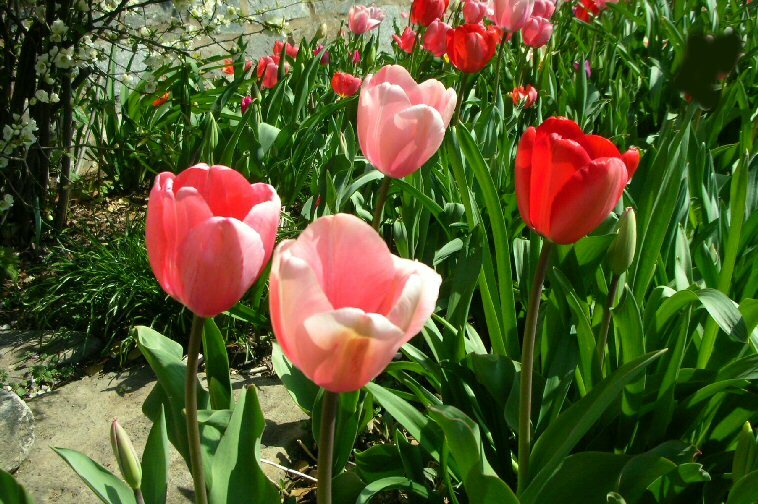 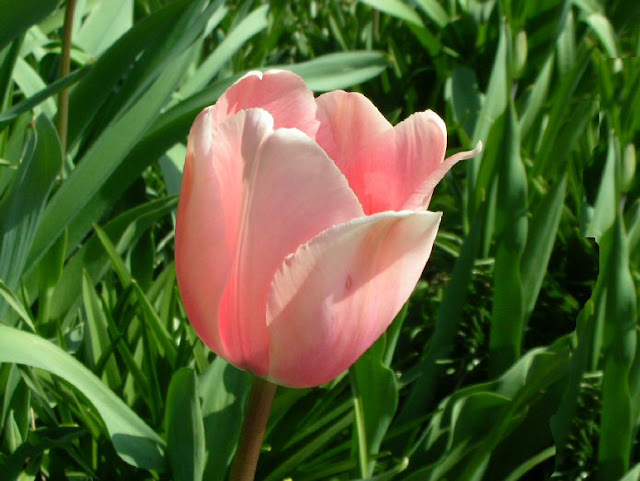 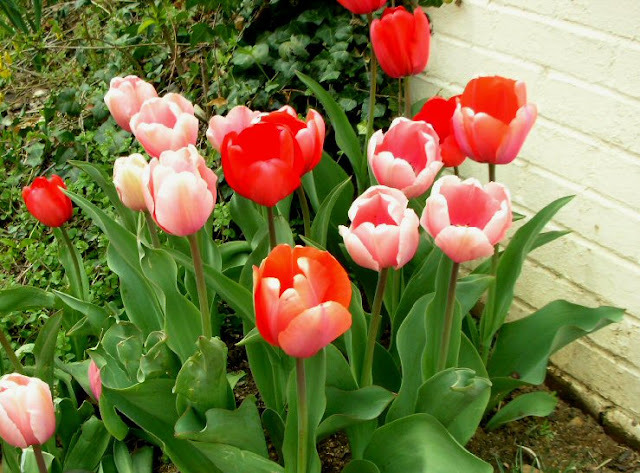 Tulips come in every color, single or double, mixed colors, different sizes. 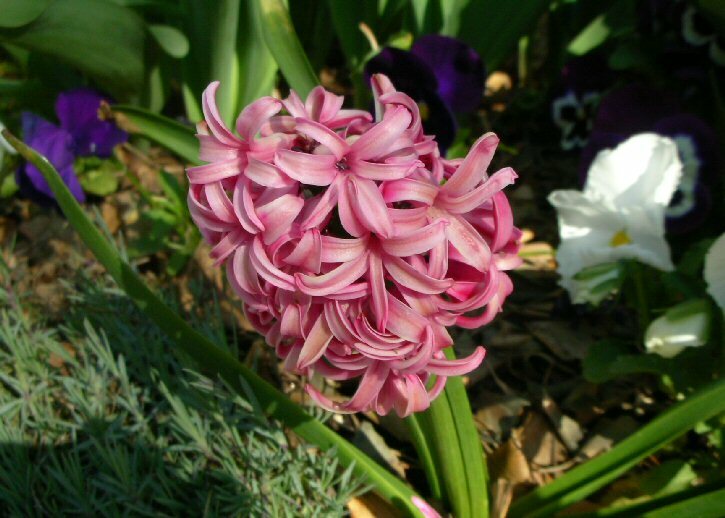 blooming for a long time in your yard. 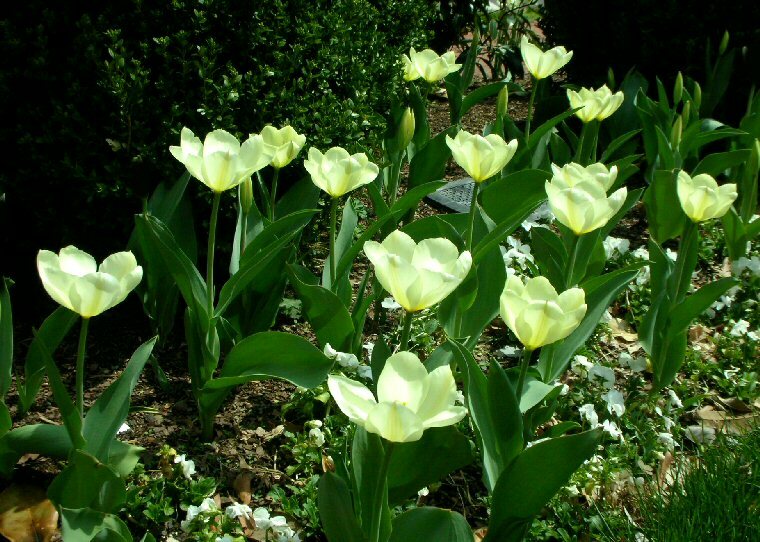 "Butter Crisp" Yellow Tulips with Cream Pansies. 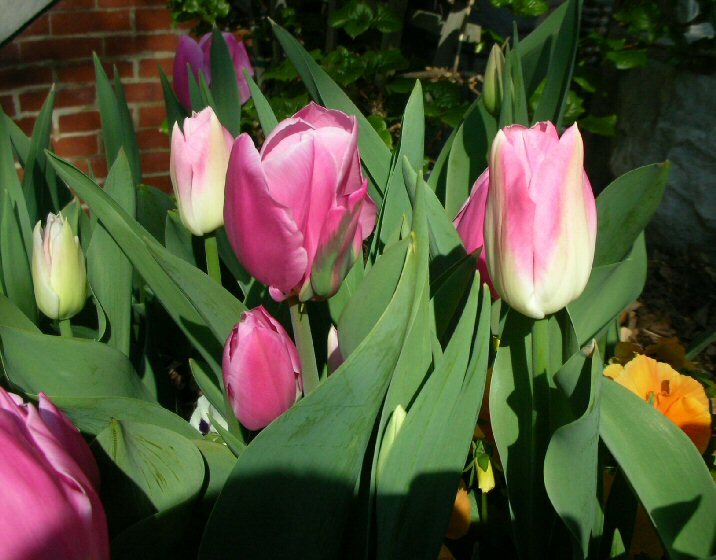 and as the day gets warmer and the light brighter, they open more and more. stems, and the late blooming tulips have very tall stems. 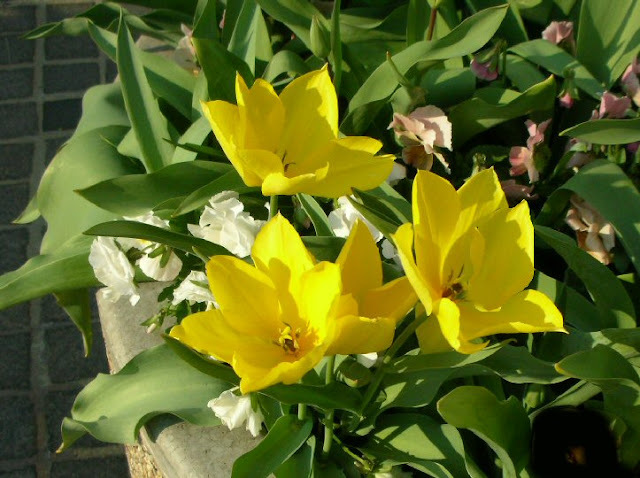 "Gold Star" Tulips with short stems. 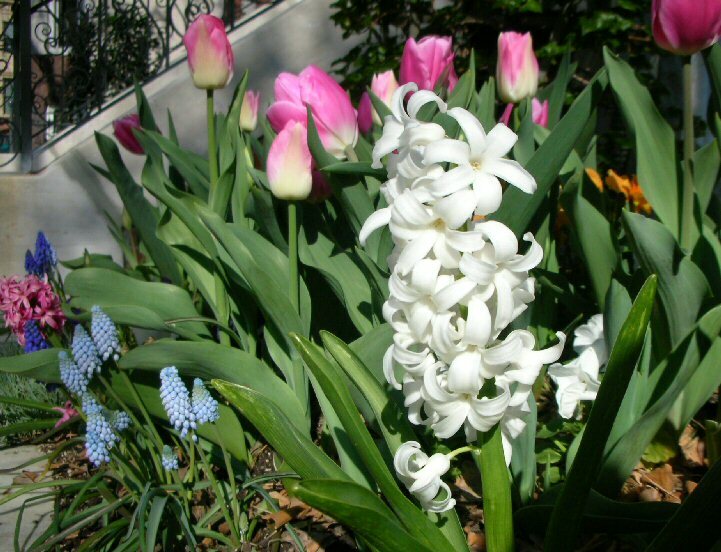 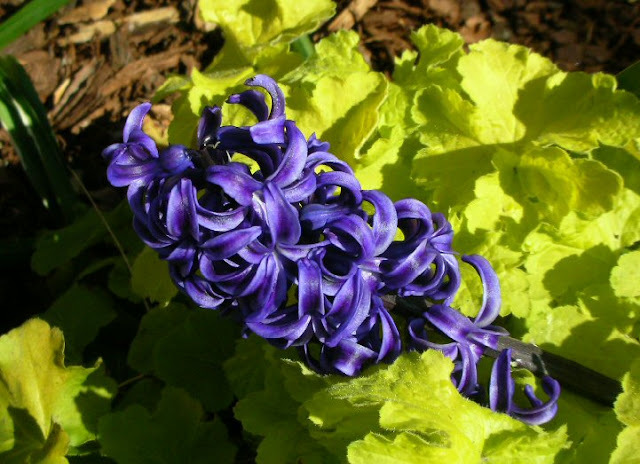 Grape Hyacinths and "Dazzling White Hyacinths"
All of these hyacinths have lovely aromas. "Tangerine" Tulips with unusual striped leaves. 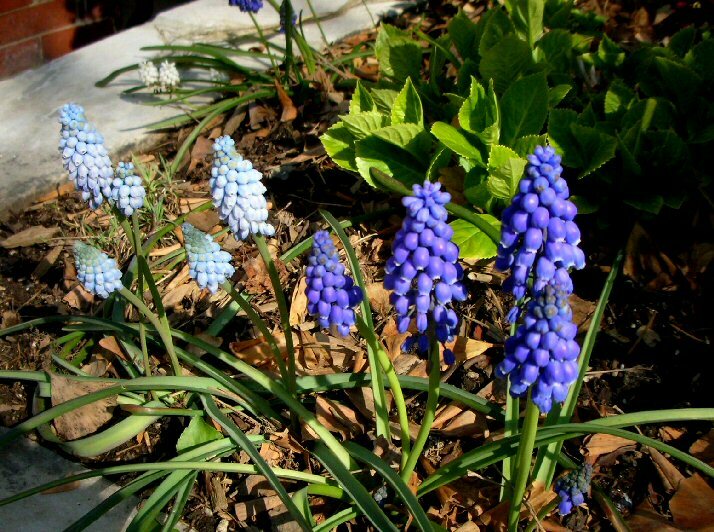 These were in a courtyard of the Smithsonian. 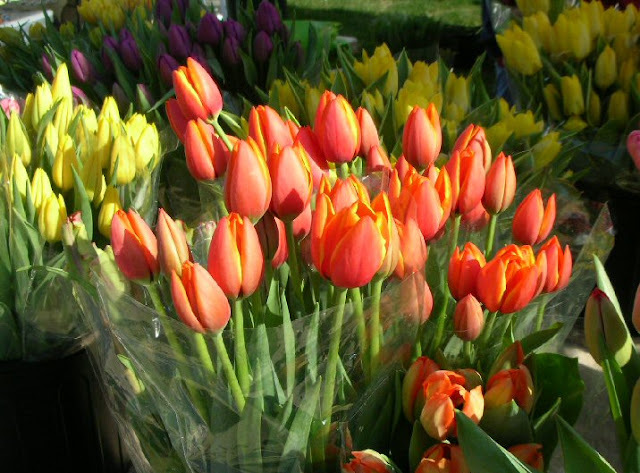 On Sunday mornings, I always go to the wonderful Farmers Market at Dupont Circle. All the vendors must raise their own products and within 100 miles of Washington. fresh flowers, pastries, fruit and vegetables, and preserves. It is a fantastic resource for those living in the neighborhood. 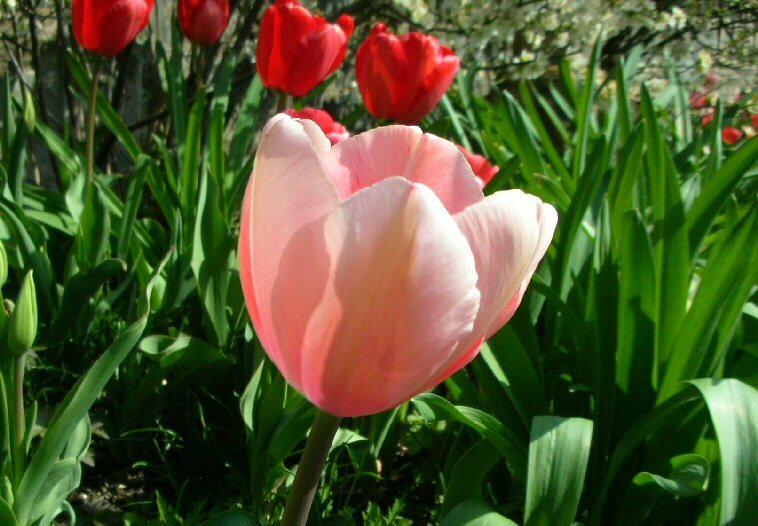 Every Sunday. 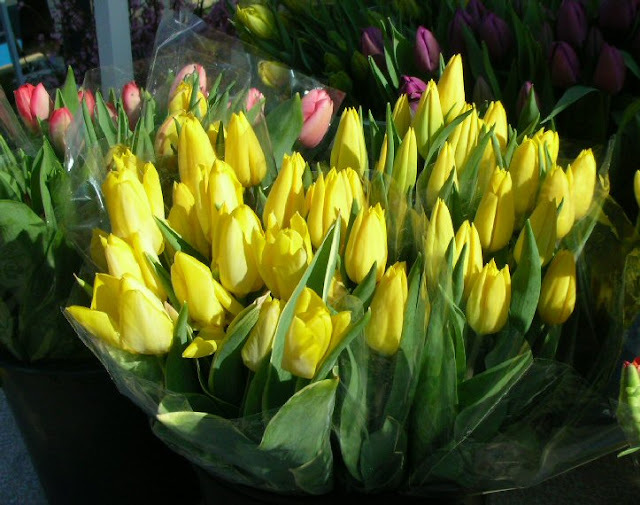 A tub of fresh yellow tulips, cut early this morning. Red "Matador" Tulips, seen from above. 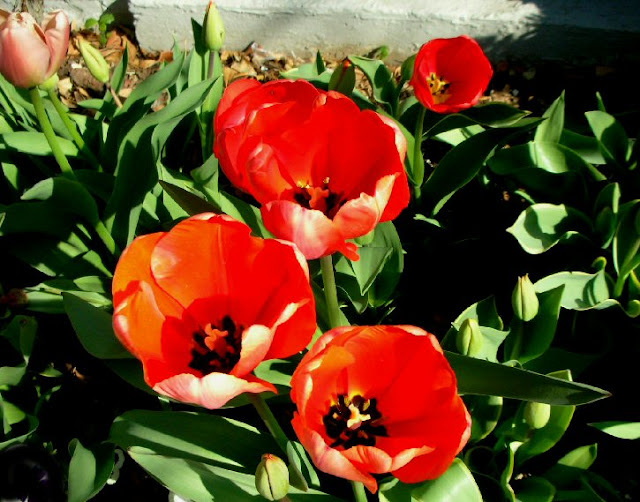 Red "Matador" Tulips, seen from the side. 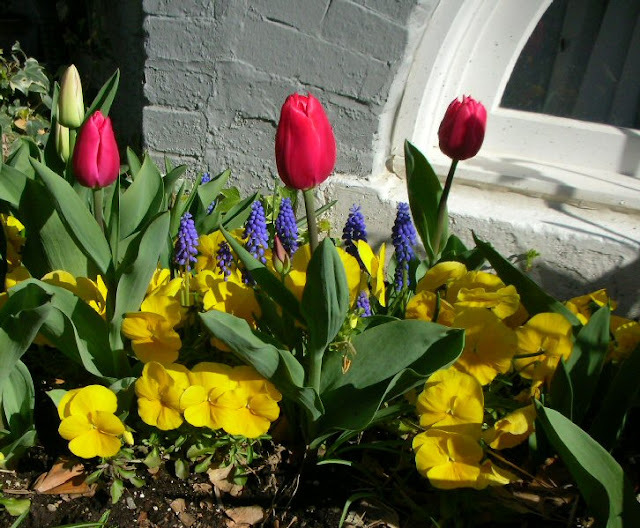 Tulips, pansies, and grape hyacinths. 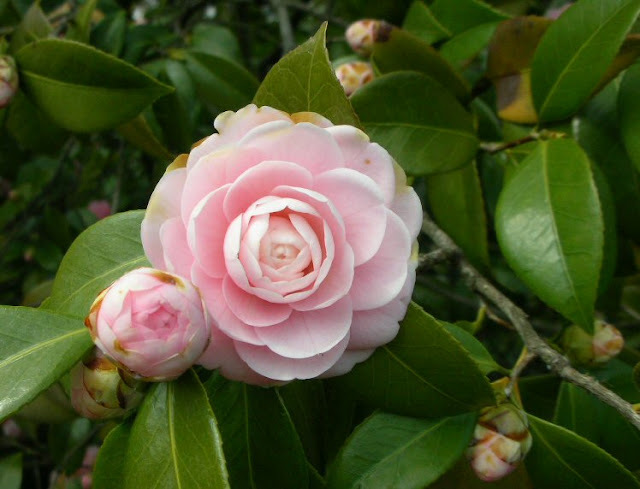 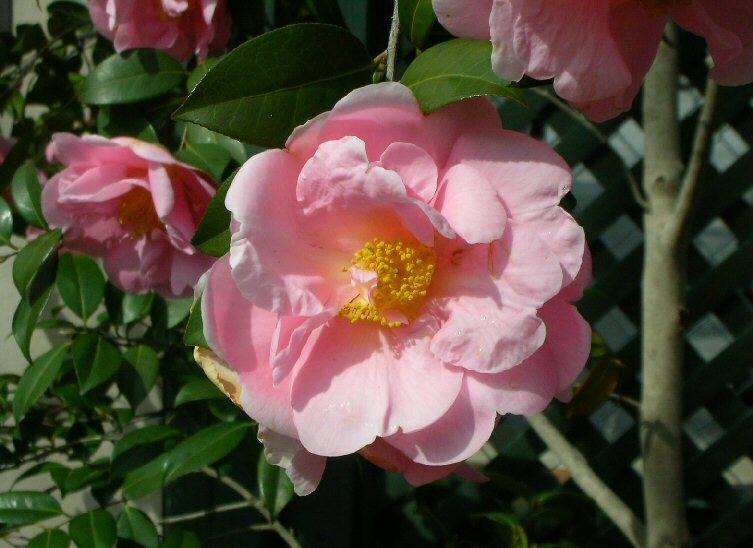 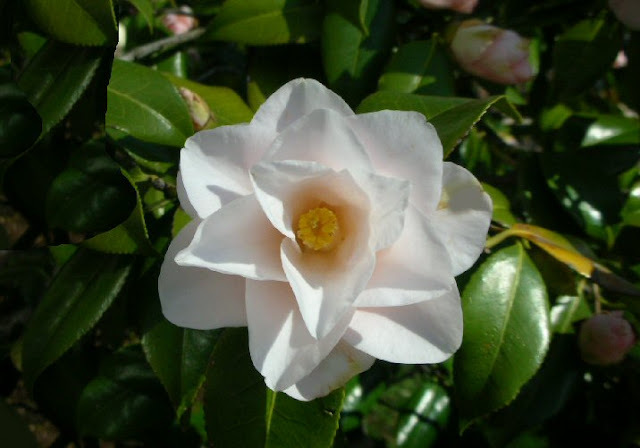 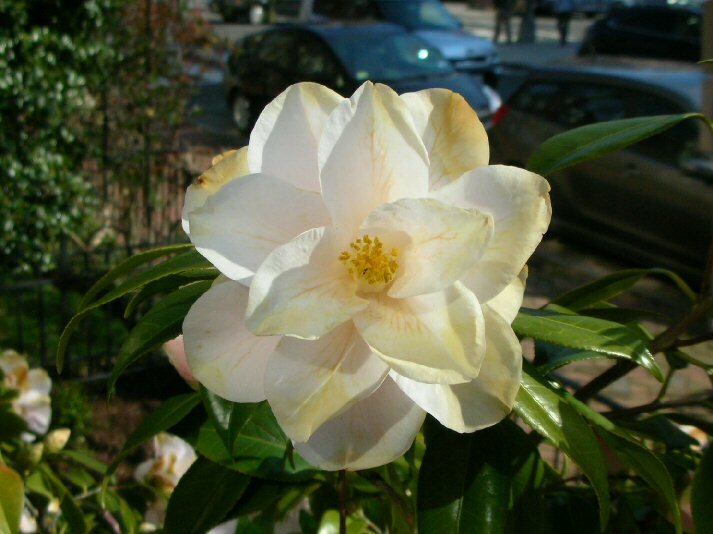 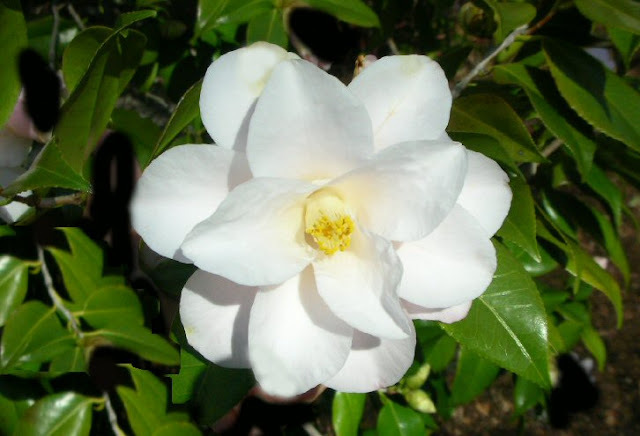 Camellias" grow on bushes all over. 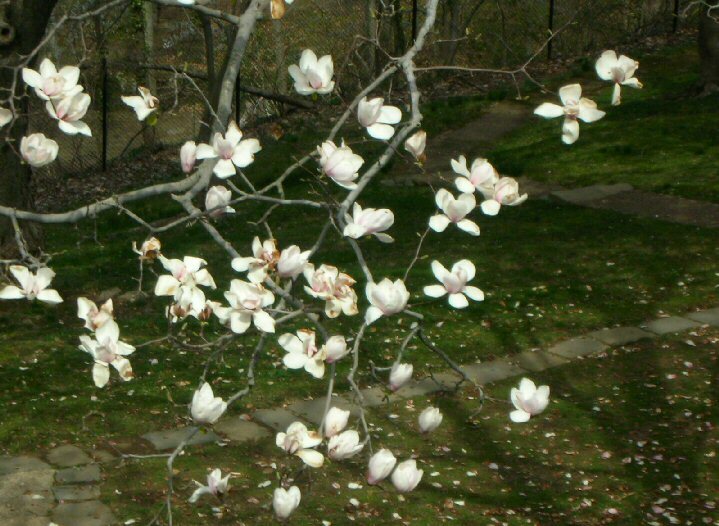 The leaves are shiny and stiff. 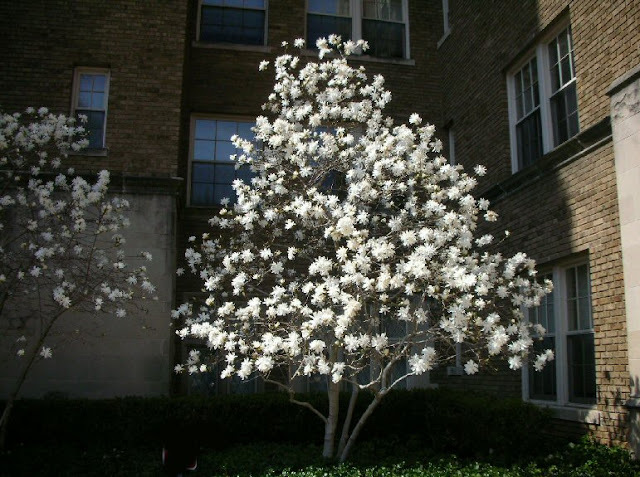 "Star Magnolia" Tree along Embassy Row. 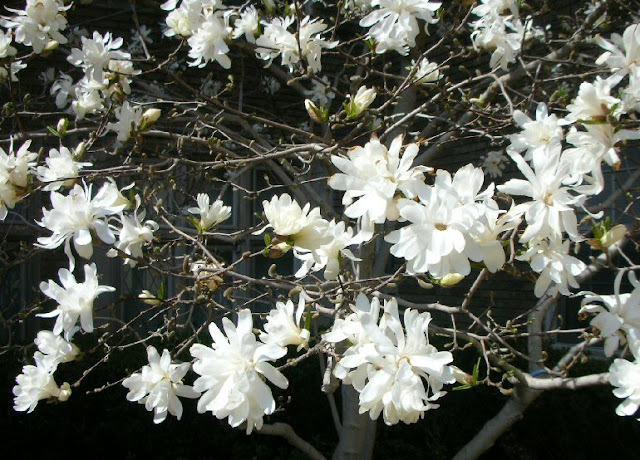 There are many colors, sizes, and forms of magnolias. 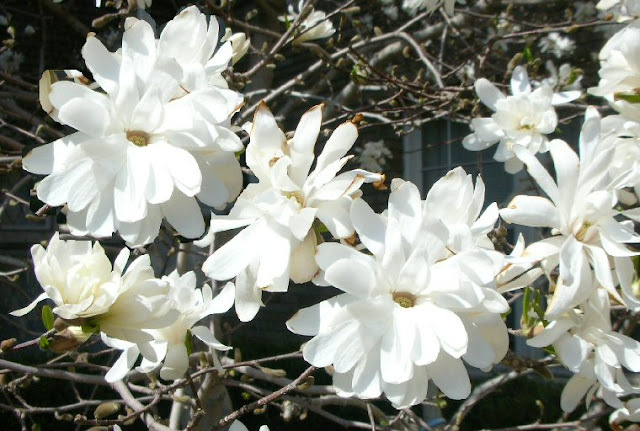 The blossoms of the "Star Magnolia" look like stars with many points. It's Flowering Cherry Tree Time in Washington, D.C., the first weekend in April. 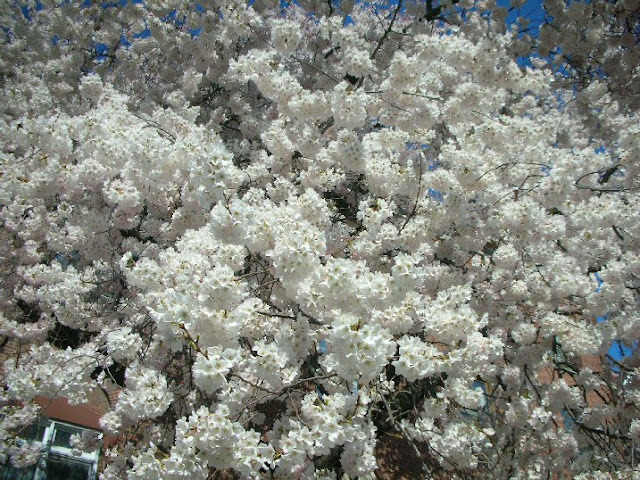 These are some pictures I took a couple of years ago, but the trees are in bloom today. 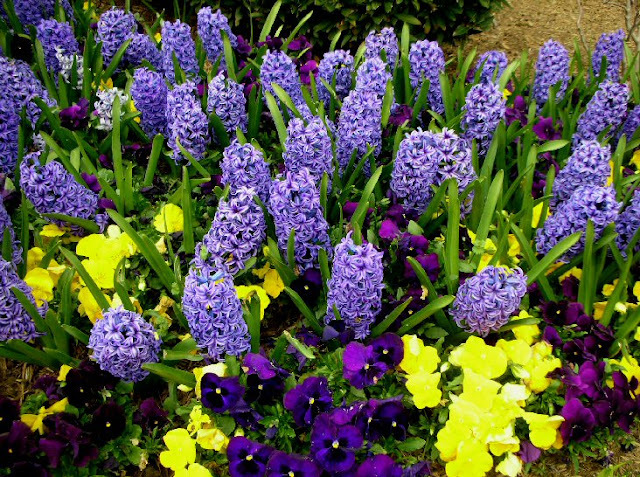 are planted all around the Basin. 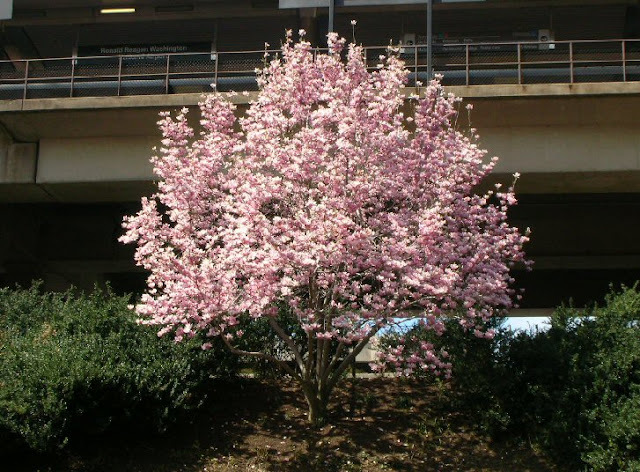 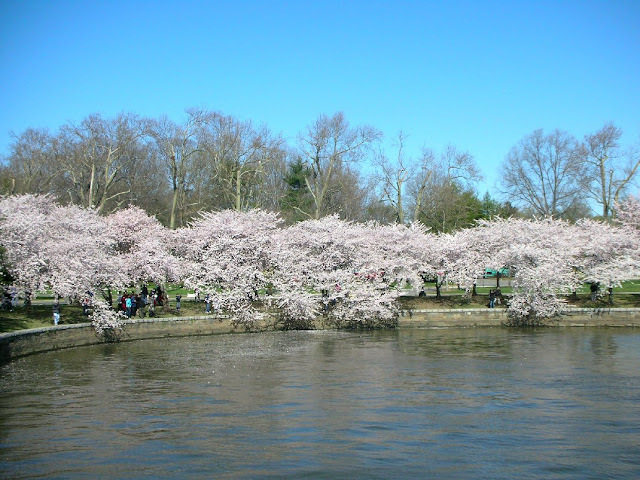 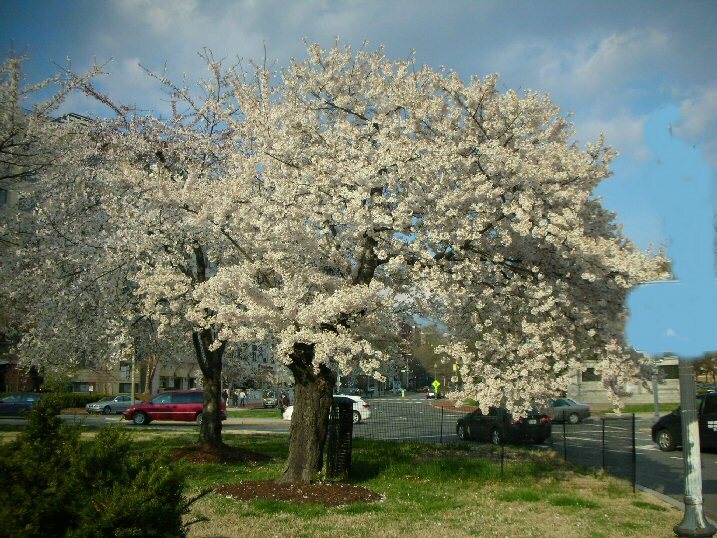 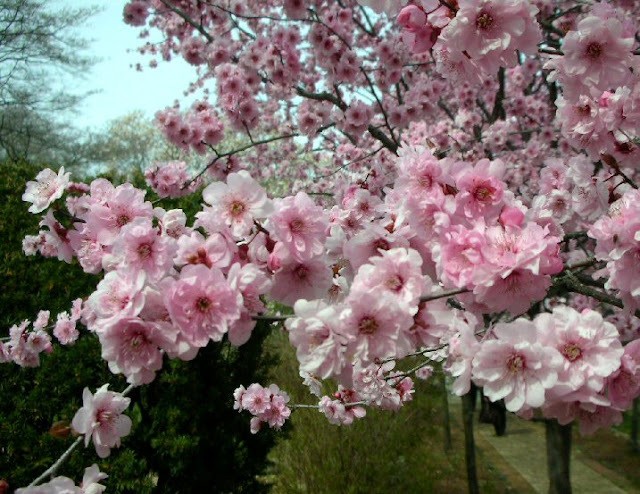 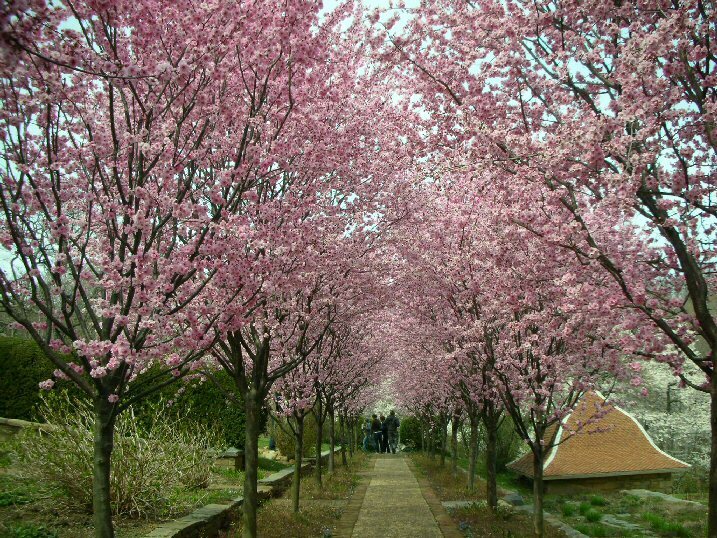 There are several different kinds of cherry trees, in pink and white, single and double. Each step that you take begs for a photo. 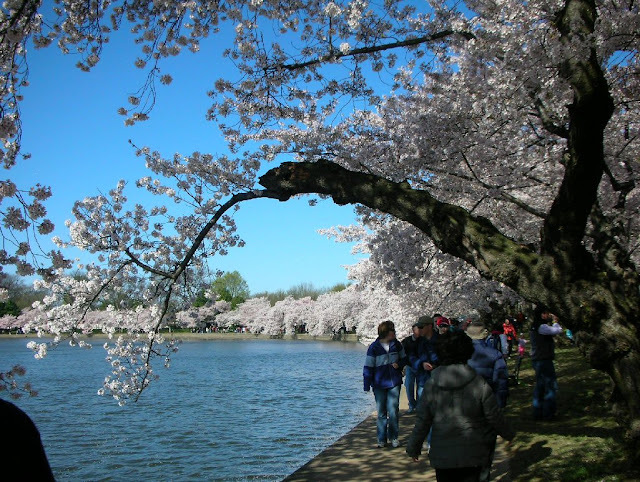 The walking path goes all around the Basin. 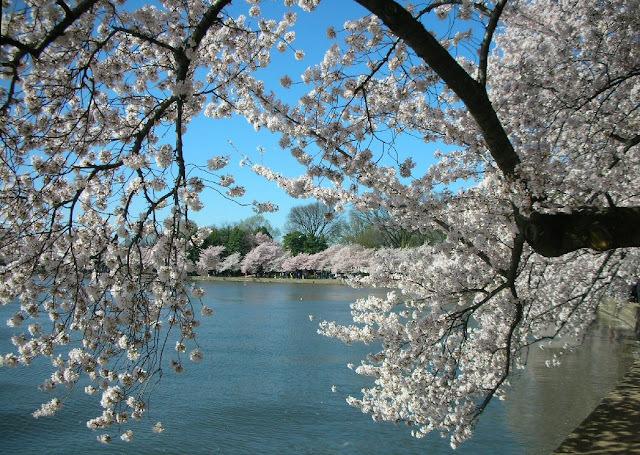 They purposely allow the branches to drape over the water. 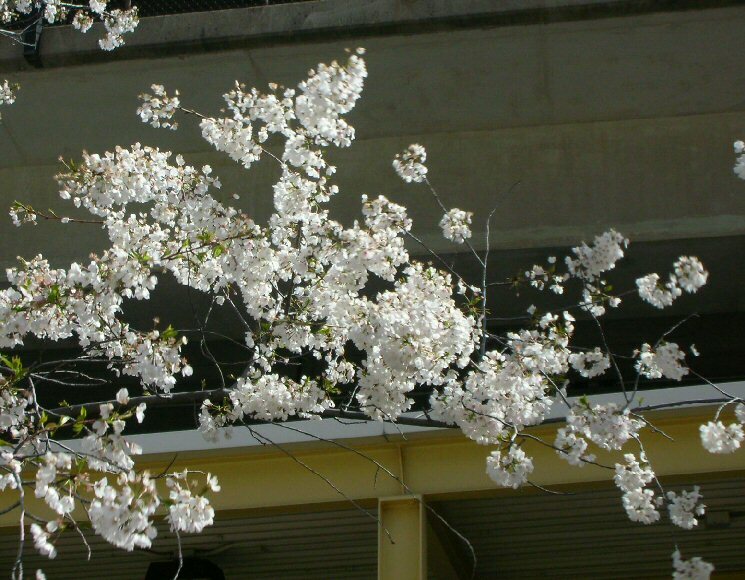 These are Double White Blossoming Cherry trees. 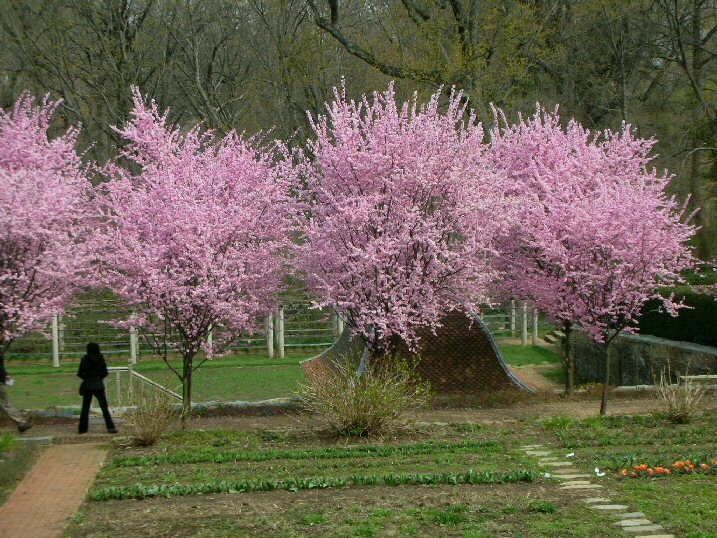 Pink Trees are around the pond across the road. 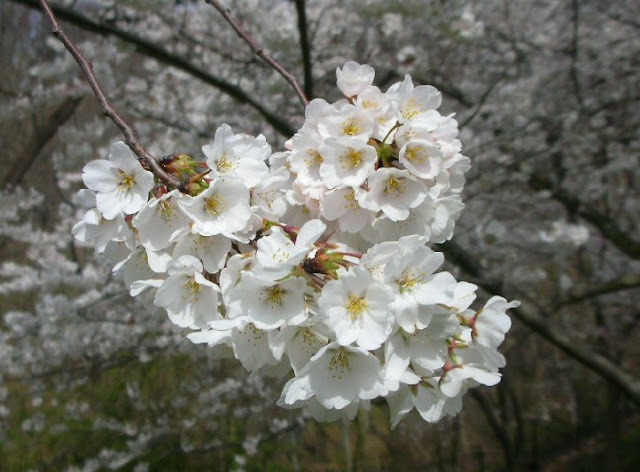 There are flowering cherry trees all over town; it is like walking through clouds of petals. 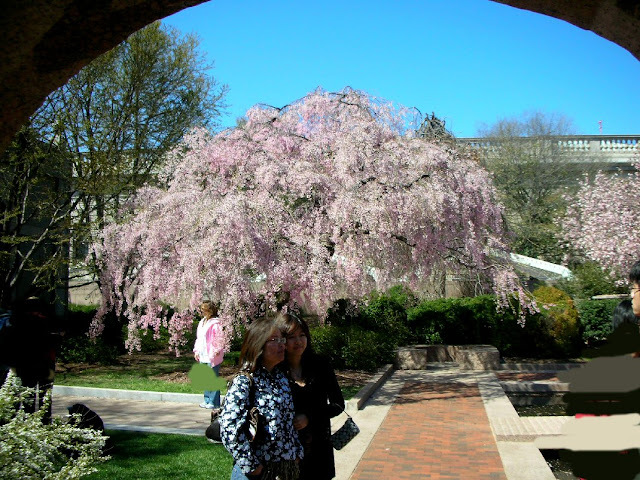 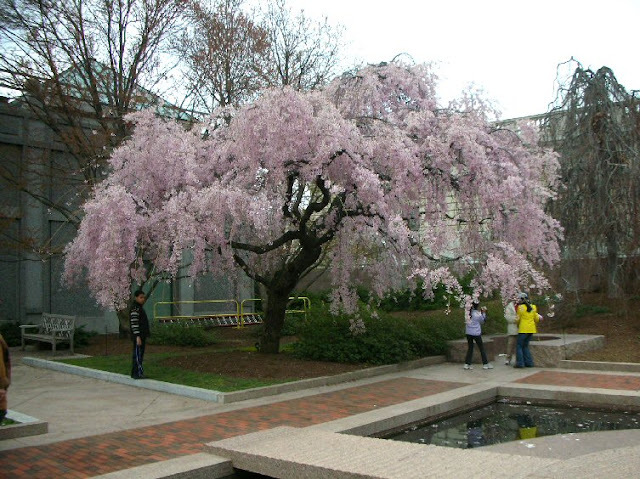 This is a Pink Weeping Cherry by the Sackler Museum, a couple of blocks away. 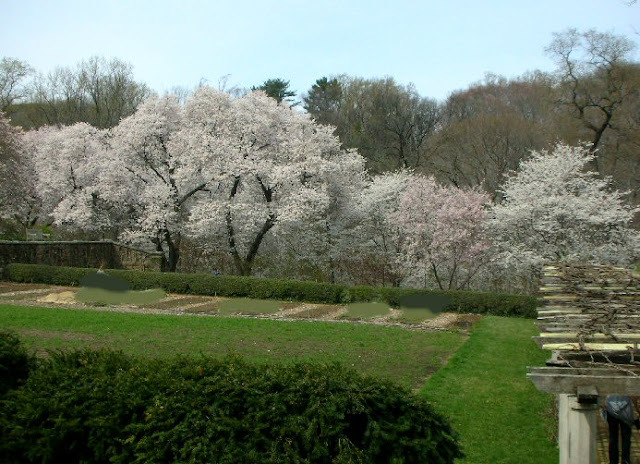 but now national park and garden and museum. 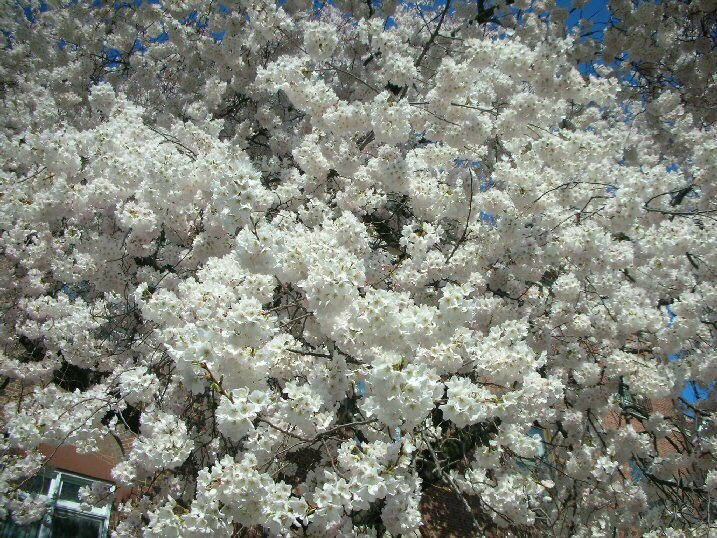 These are Flowering Crabapples. 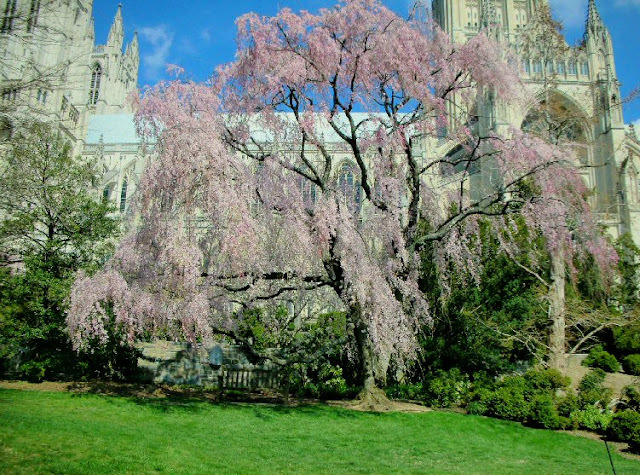 National Cathedral in Washington is high on a hill, and alongside it is the "Bishop's Garden." 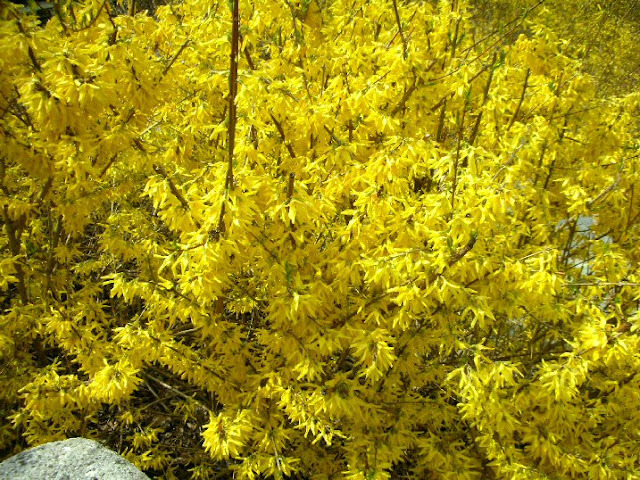 Brilliant Yellow Forsythia bushes are all over town. 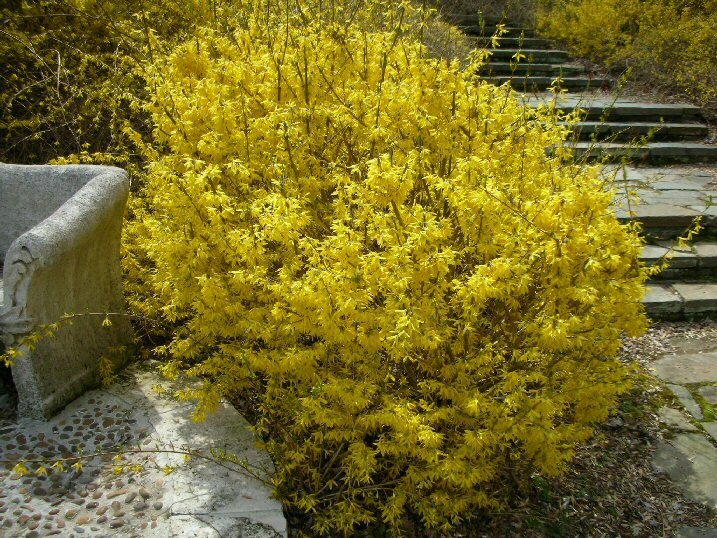 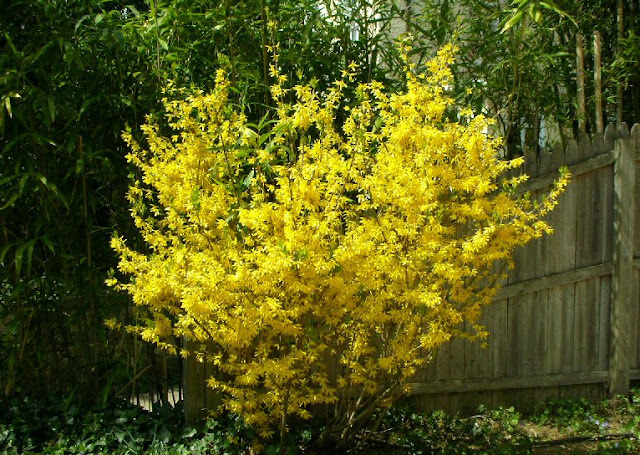 Yellow Forsythia. 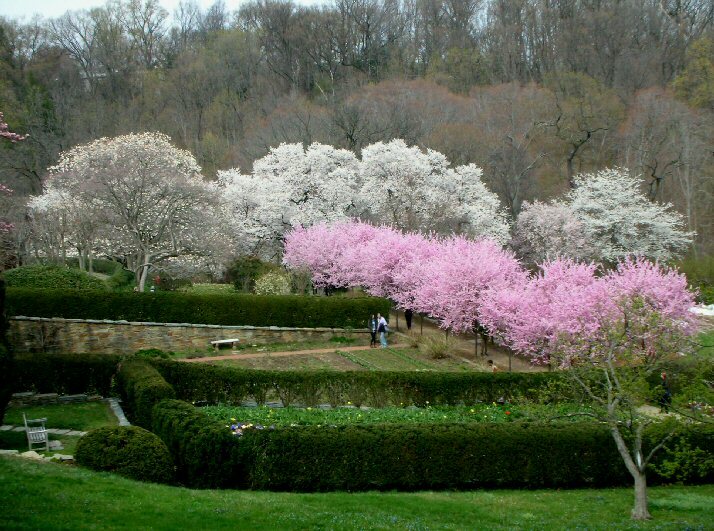 Dumbarton Oaks has an entire hillside covered with them. 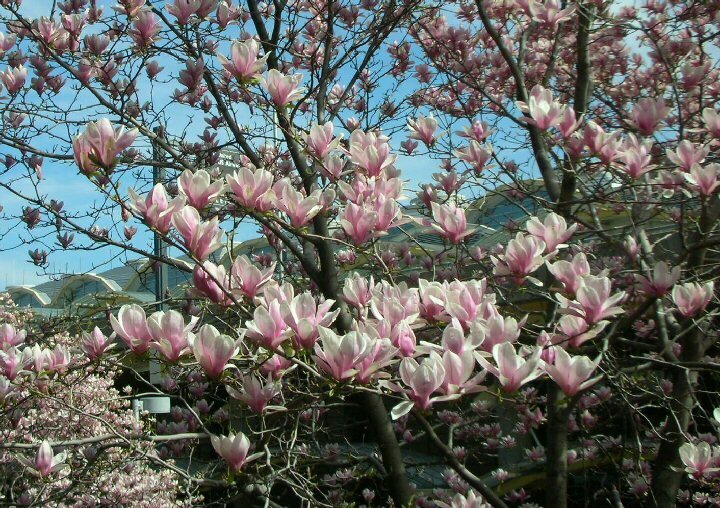 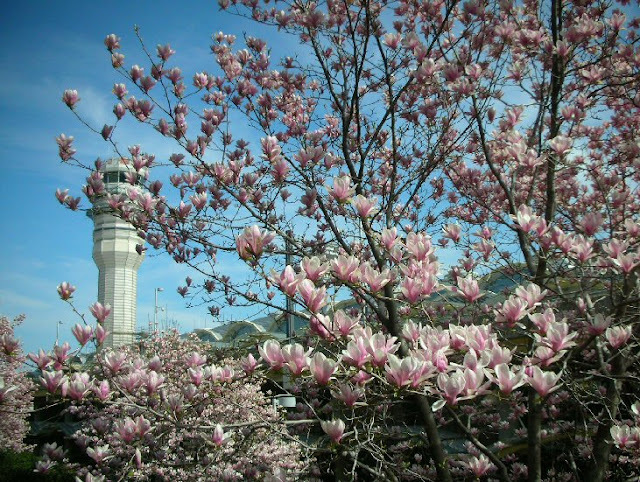 Magnolia Trees are in bloom all over Washington . first things I see when I land and walk to the metro station. Branches of Magnolia blossoms. They are thick and luscious, as if carved out of wax. Magnolia tree by my hotel. 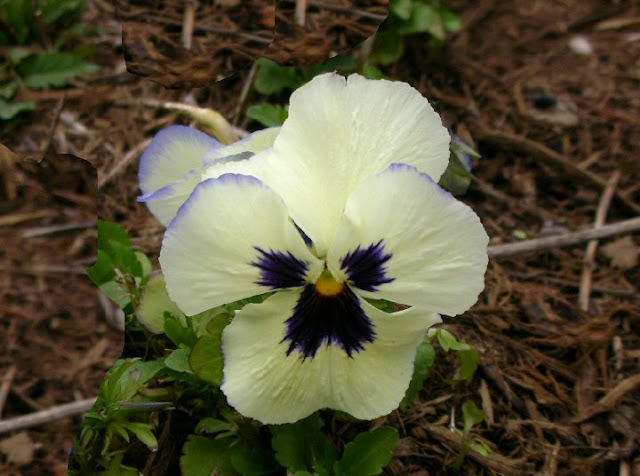 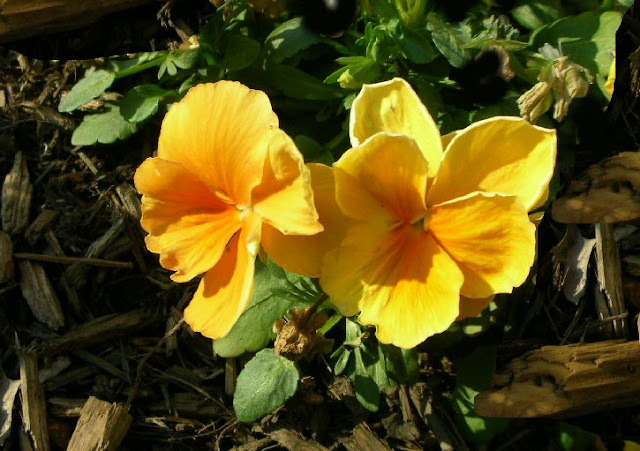 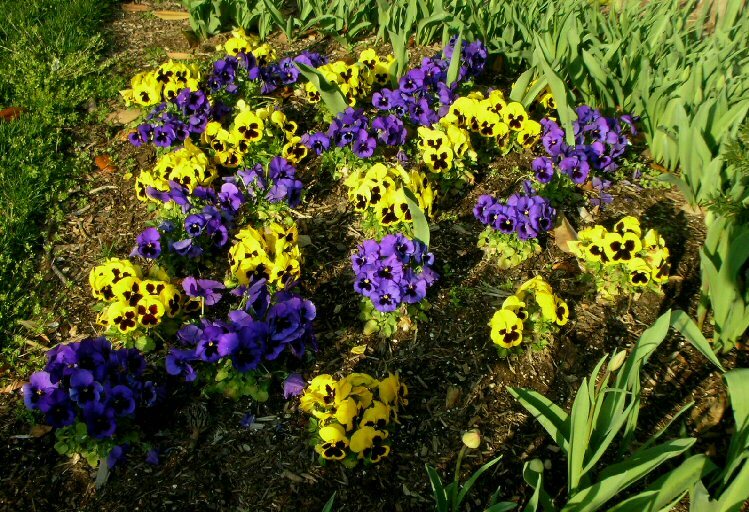 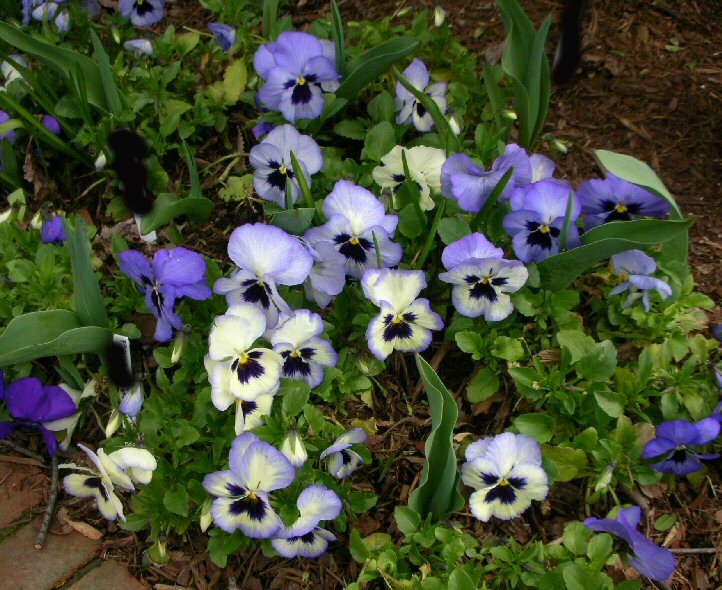 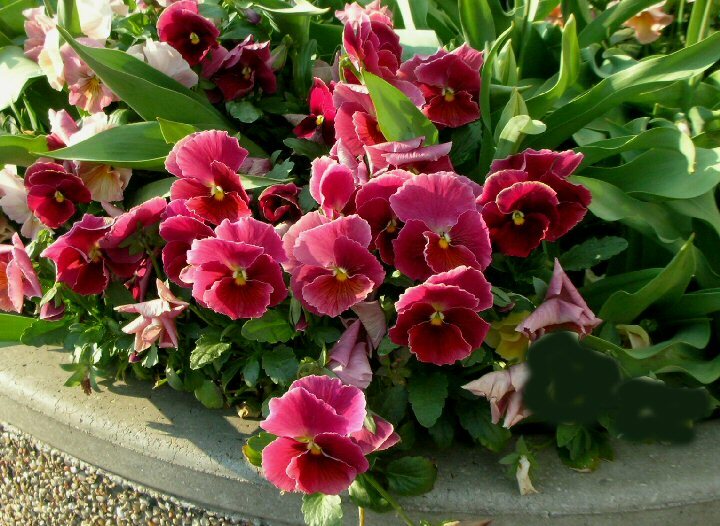 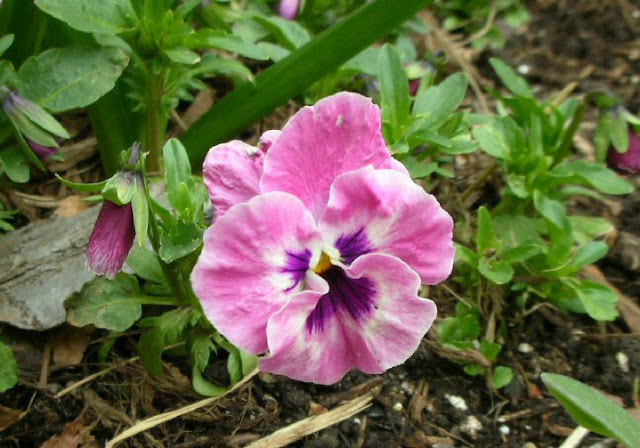 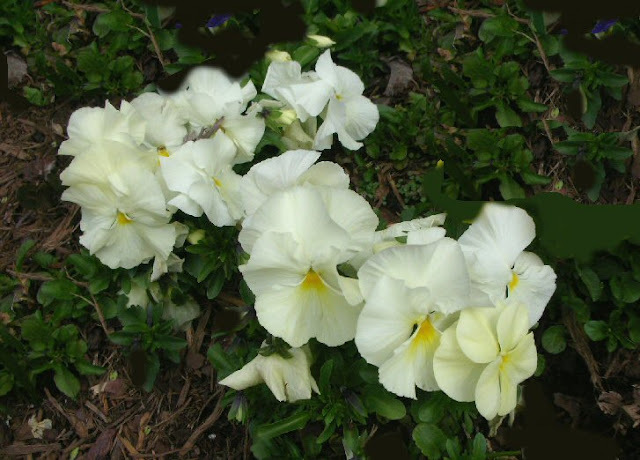 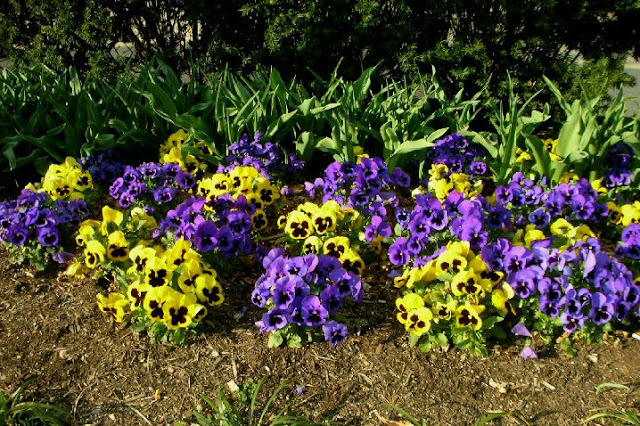 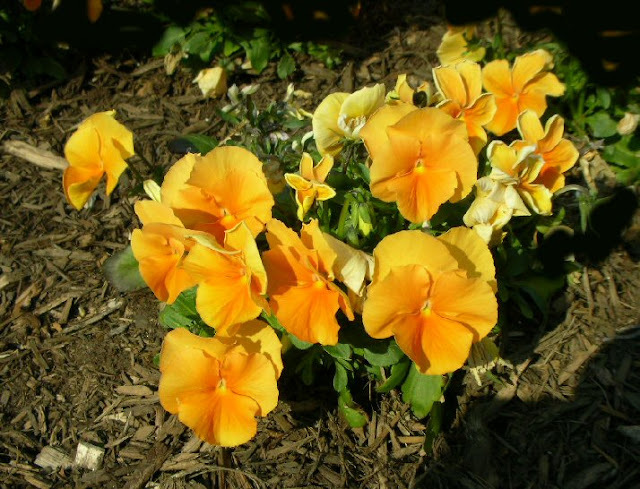 Washington also has the best pansies in the world, planted all over town. 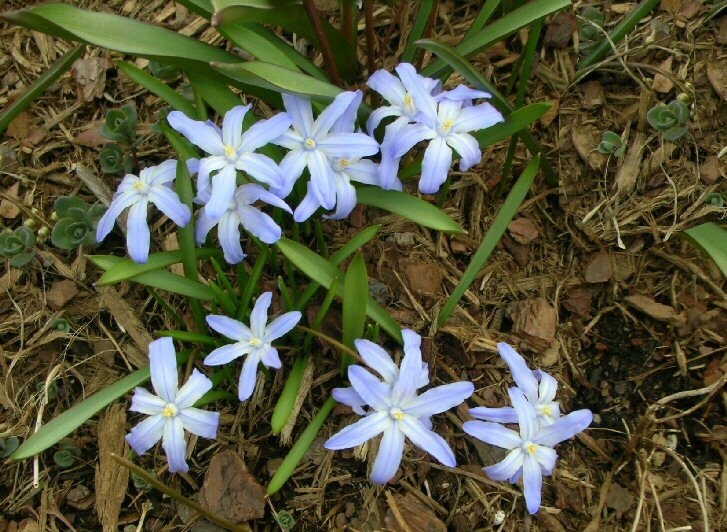 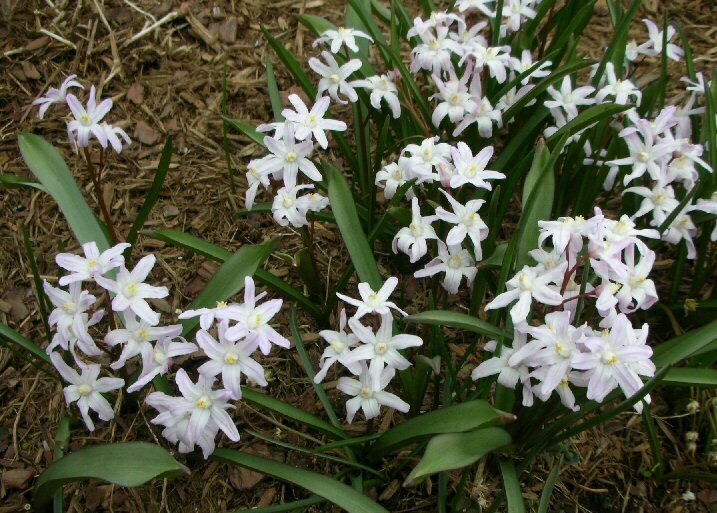 Some are planted in the fall and start growing and blooming through the snow. 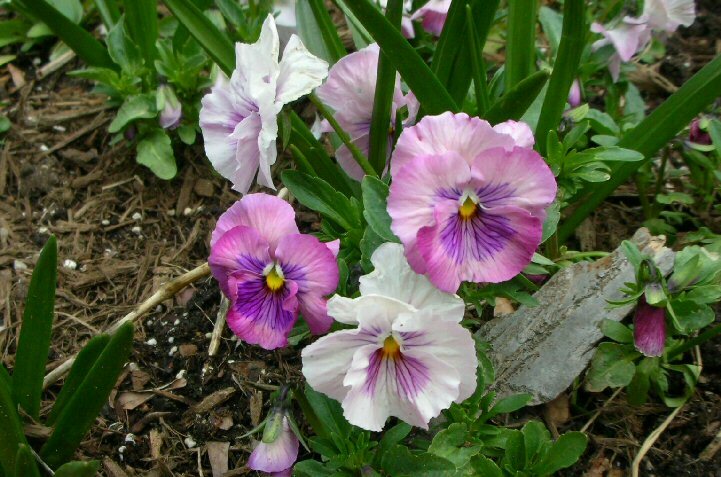 Other are planted in the spring. The airport has millions. 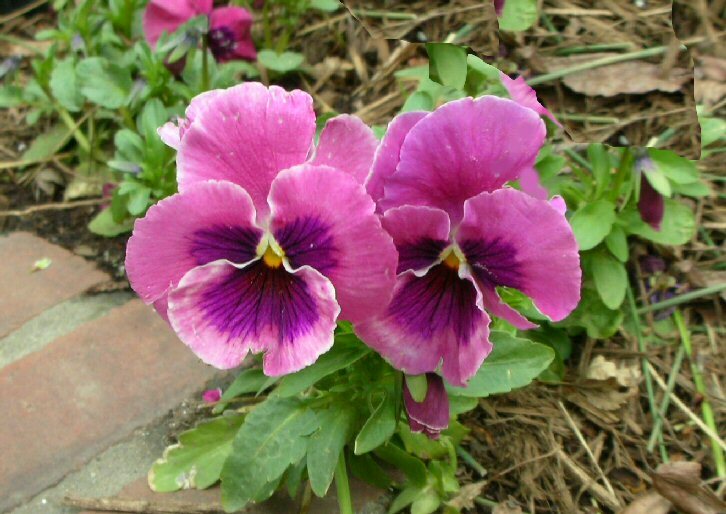 with pansies of every color. Walking around the neighborhood was always a delight. 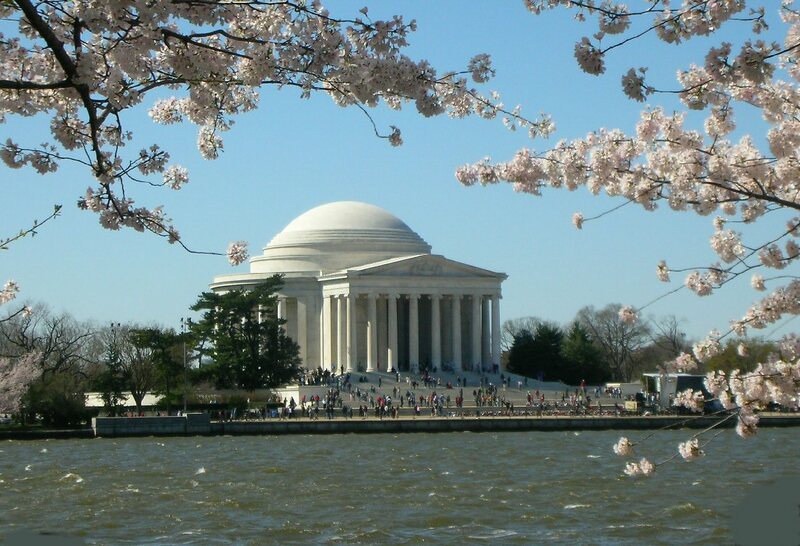 Just thinking - I ought to be in Washington right now.